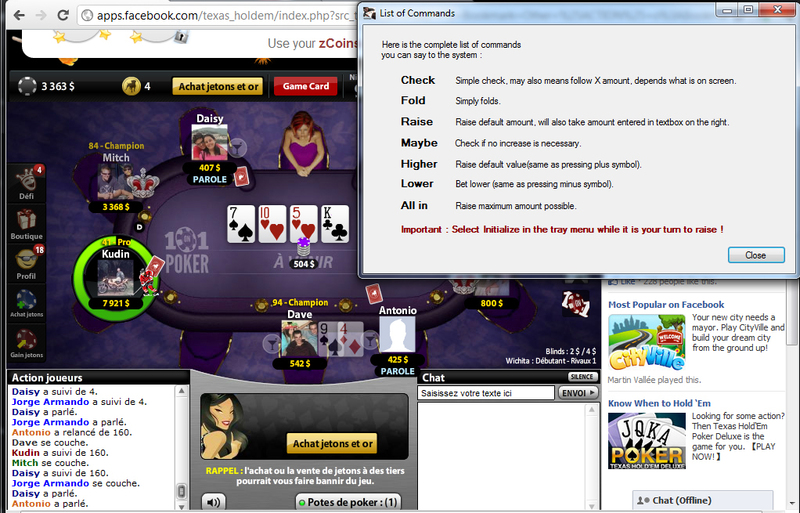 Voice Activated Tool for Zynga Poker on Facebook, let's play without using the mouse or keyboard. You say the 'Check', 'Fold', 'Raise', 'Maybe', 'Lower', 'Higher' and the program executes it. The Demo puts a five seconds delay in front of command.VoActPoker is a small utility that does the work for you, it let's you 'Check', 'Fold', 'Raise' and others by saying these commands. CsvTool analyzes, verifies, and transforms CSV (comma-separated value) data. Qweas is providing links to Voice Activated Tool for Zynga Poker on Facebook 1.2 as a courtesy, and makes no representations regarding Voice Activated Tool for Zynga Poker on Facebook or any other applications or any information related thereto. Any questions, complaints or claims regarding this application Voice Activated Tool for Zynga Poker on Facebook 1.2 must be directed to the appropriate software vendor. You may click the publisher link of Voice Activated Tool for Zynga Poker on Facebook on the top of this page to get more details about the vendor.